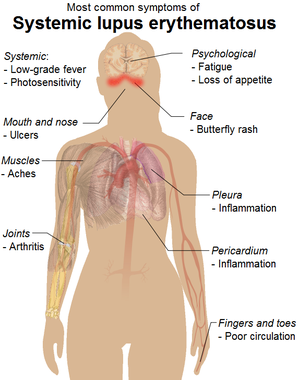 Systemic lupus erythematosus is one of the least understood and hardest to diagnose autoimmune diseases around. Though it might become chronic at some points, it can come and go at the will of your immune system with no apparent reason for being there in the first place, or may start as a result of potential triggers. It is not to be confused with the skin variety of lupus, and affects you internally, including all of your organs and any parts that are within you. This type of lupus means that your body’s immune system fights off illnesses, diseases, infections and viruses, but forgets that once the job has been done, that it has to shut down and leave that now healed area alone. It continues attacking the area as if it was still affected, seeing everything and anything as the enemy, even an unborn fetus. It may even confuse healthy things with bad things, attacking healthy tissues and cells without any known reason, but it can result over the long-term in chronic inflammation of joints and tissues. At the very worst, this type of lupus may become severe enough that it might kill you. Most sufferers are women, 9 times more than men, but it can start even in infancy, though most will get it between ages ten and fifty. Interestingly, though anyone can get it, those of Asian or African descent are at a higher risk than Caucasians. Sometimes it might even be associated with certain drugs, stress and even trauma, though even the potential of it being hereditary has not been ruled out by researchers, though its true cause is unknown. There may be no cure for systemic lupus erythematosus at present, but research has been going on for decades. Treatments vary to treat the symptoms quite often, though radical medications have included such things as anti-malaria drugs and others. It all depends on the symptoms that a person gets and each person’s symptoms vary and their severity may change too. Regardless, for those of us who have been diagnosed with this disease, there is hope and it can be lived with.